A directory of Amish furniture in Michigan With a thriving Amish population–the 6th-largest in America–the Wolverine State has no lack of Amish wood artisans creating fine home furnishings in a wide range of styles and designs. Residents of Detroit, Lansing, Grand Rapids, Ann Arbor, Battle Creek, Kalamazoo, Flint, Dearborn and other Michigan cities can find Amish furniture sellers within a reasonable drive. Wolverine State craftsmen build pieces for every corner of the home, including kitchen sets, a wide range of table and chairs, offfice furniture, children’s furniture, rockers and gliders, kitchen cabinets, outdoor furniture, and much more. Amish craftsmen provide both standard furniture lines and custom work for their Michigan customers. Amish-crafted dining chairs, leg and pedestal tables, bar stools, living room furniture, dining rooms, office furniture, desks, dressers, beds, coffee tables, rockers, gliders, sofas. 570 South Tanner Lake Rd. Amish-made bar stools, occasional tables, bookcases, hutches, rustic pine furniture, rockers and children’s rockers, entertainment centers, and much more. Two Michigan locations. Traditional and rustic Amish furniture from Michigan. Hardwoods including oak, cherry, maple, and hickory. Customizable Amish dining tables in single or double pedestal style, in Harvest or Shaker design. Magazine end tables, mantles, tavern mirrors, more. Furniture seller in the Claire MI Amish community; gliders, rockers, benches, stools, benches, office, bedroom, living room, and more. Amish furniture in a range of styles and stains. Hardwoods including oak, quarter-sawn oak, elm, hickory, maple and brown maple, cedar (regular, red, and rustic), cherry and rustic cherry. Furniture styles include Cottage, Traditional, Mission,Rustic, Shaker. Pick up or delivery; no online sales. Amish curio cases, children’s furnishings, rocking horses, entertainment centers, desks, bedroom suites, hutches and more. Unfinished Amish furniture along with non-Amish manufacturers’ products. Southern Michigan Amish made furniture. Custom orders, also sells Amish quilts and Amish-made kitchen cabinets. Designs featured include Mission, Craftsman, Shaker styles. Started by a female former Amish convert; featuring furniture from Ohio Amish. Amish-made bathroom items, painted pine furniture, wall decor, office, living room, bedroom furniture, more. Amish furniture styles including Mission, Americana, Contemporary, Eclectic, Modern Country, Shaker. Variety of styles of Amish dining room tables. Leg tables, trestle tables, pedestal tables. Also sells dining room chairs, barstools, benches. Cabinets, hutches, wine racks and more. Styles include Mission, Contemporary and Traditional. 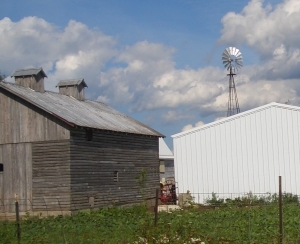 Sheds, gazebos, and outdoor Amish structures including play houses, chicken coops, log cabins, horse barns, metal buildings. Also Amish cupolas, weather vanes, dog houses, rabbit houses. Large retailer shipping around the world. Featuring Ohio and Indiana Amish made furniture. Amish-built furniture, red wagons, wind chimes, candles; baby furniture, rustic furniture, pie safes, jelly cabinets, bookcases, deacon benches, upholstered furniture, and much more. Michigan online Amish furniture supplier. Wide range of styles of Amish made furniture. Delivery within Michigan and out of state. Amish mission tables, pedestal tables, leg tables, corner nooks, corner cabinets, oval tables, benches, dining sets, sideboards, buffets, wide range of chairs, Shaker, Mission, traditional styles. Amish made unfinished furniture, including log furniture, gun cabinets, curios, china cabinets, pie cabinets, pantries, chef carts, armoires, writing desks, and more. Located near the Clare Amish community in north-central Michigan. Carries rustic Amish log furniture from Montana Woodworks Log Furniture company. Sells extensively online; also has large central Michigan showroom. Grand Rapids-area furniture store in business over a half-century; working with Amish suppliers for over a decade. Amish-made chairs, tables, rockers, desks and more. Full line dealer of Amish-crafted furniture also doing a lot of custom work. Looking for Amish furniture dealers outside Michigan? Try the Amish Furniture Guide main directory, featuring full listings of Amish furniture sellers in the USA and Canada. Note to Michigan residents: Please be sure to check opening hours of any Amish furniture businesses listed in this guide before traveling long distances. While we strive to keep this directory up-to-date, business locations and schedules can change. Not responsible for changes to information. It’s hardly surprising that Michigan is home to dozens of Amish furniture businesses, with numerous Amish furniture manufacturers and retailers found across the state. Michigan has long seen a significant Amish presence, and today is home to nearly 12,000 Amish (see Amish Studies web site). Many Michigan Amish produce furniture as a means of providing a living for their families. While farming remains a highly valued occupation among Amish, lack of affordable farmland has encouraged Amish to enter small business. Furniture manufacturing, allowing Amish to draw on homespun skills honed on the farm and in a manual labor upbringing, is an obvious choice, a small industry well-suited to the Plain community. Multiple Amish furniture manufacturers can be found in communities such as the sizeable St. Joseph County community in southern Michigan, bordering Indiana and the large Elkhart-Lagrange settlement. Amish are seen in other locations across southern Michigan, including Branch and Hillsdale County. Michigan hosts Amish communities up through central part of the state and even into the Upper Peninsula. Amish furniture is heavily associated with certain concepts. First of all, quality is one aspect strongly connected with furniture sold under the “Amish origin” label. Amish craftsmanship has a long history. Amish forefathers arriving in what would become Pennsylvania constructed barns and farmhouses meant to last generations. And many have. The idea that you make a product to last is deep-rooted among Amish, who themselves pass heirloom furniture down family lines. Related to this concept is the ethos found in the Biblical admonition to “do unto others”. With these ideas in mind, producing quality furniture comes second nature for Amish. Secondly–and related to the first concept–Amish are known for the top-notch materials they build their furniture with. You’ll find most sellers of Amish furniture advertising “solid hardwood” furniture. You may read that furniture is neither “pressed” nor constructed of “particle board”. Indeed, Amish woodworkers favor solid hardwoods such as oak, hickory, walnut, maple, and cherry, among others. Some Michigan Amish furniture craftsmen create pieces outside of the above formula, using pine wood, or rustic hickory to create special varieties of furniture. A number of outdoor Amish furniture makers use the durable and attractive “poly” material to craft tables, chairs and other outdoor accessories. Still other Amish woodworkers may incorporate upholstery or leather coverings into their work. Thirdly, Amish furniture is known for the value it provides. While usually not the cheapest furniture on the market, Amish-made woodworking typically offers great value for money spent. Time-tested construction methods and attention to detail ensure durability of Amish furniture pieces as well as giving Amish furniture visual appeal. Amish furniture makers in Michigan and elsewhere create furniture pieces in a wide range of styles and designs. As mentioned, Amish-made furniture is typically made from a wide range of hardwoods. Styles may vary as well, from the traditional classic styles such as Shaker, Mission, Colonial, and Queen Anne, to the modern and contemporary styles popular in urban homes across North America. Amish woodworkers are known to be adaptable, and despite the perception that Amish people are reluctant to change and accept new innovations, Amish furniture makers readily adapt and create new styles for their customers. For the customer with something specific in mind, custom Amish furniture craftsman create tailored pieces aimed to please even the most demanding clients. Amish custom furniture makers often have a long waiting list, so it is good to think in advance if you’d like to have your custom furniture piece created by an Amish craftsman in Michigan or elsewhere. As home to one of America’s largest populations of Amish, Michigan is also a prime destination for Amish furniture. And with Amish increasingly moving in search of less expensive and less crowded land, the rural counties of the Wolverine State are likely to continue to see an increase in Amish population, meaning more Michigan Amish furniture shops and woodworking businesses. Finding an Amish furniture seller in Michigan is easy with the online guide provided above. Many of the businesses listed above are non-Amish retailers of Amish furniture. Those wishing to buy Amish furniture direct from the source can seek out Amish woodworkers in places such as St. Joseph County, Branch County, and elsewhere. 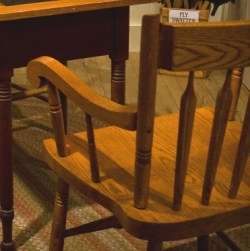 Most Amish furniture builders in Michigan provide telephone numbers which are either direct lines to the business (often a phone is kept some distance from the business in a community phone shanty) or connect to a business’s voicemail. Like other Amish shops, Michigan Amish furniture makers will generally be prompt in returning your call. Prefer to order from the convenience of home? Consider an online Amish furniture seller. I used to work for this Amish family. It has since “expanded” to include few families doing some furnitures and then either sell it direct to customer or sell at display room at Pioneer. I’m needing to mail an order to them for another barstool as we’re going to swing by them anyway on our next Michigan visit. I WANT TO ORDER SOME AMISH FURNITURE AND I NEED AND ADDRESS TO ORDER FROM. I WOULD LIKE THEM TO MAKE A FEW PIECES FROM A DRAWING THAT I MADE. Rustic log furniture in Osceola County. Just a note that I drove by it today and Amish Direct has moved to a new location on Mound road. They are south of their old location at 42200 Mound Rd in Sterling Heights, MI. They have the new address on their website. Lighted 12 gun cabinet and bow and arrow rack. I am looking for an Amish rustic furniture maker near Imlay City Mi or in the thumb area. Please respond if you know of one. I’m trying to find an Amish Carpenter to do some repairs inside and outside my Vagabond Coach in Lexington, Mi and think the closest community is Marlette or Brown City but I can’t seem to find a contact. Could you please help? 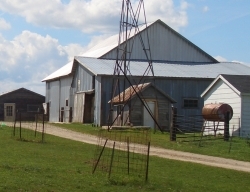 My wife and I are looking for some Amish crews that build good quality pole barns in the s/w Michigan area. Can anyone help us please? I have a victorian sampler spindle bed that needs new rails. Where can I go near Lansing to get these made? I am looking for an Amish woodworker to make cedar specialty hangers for me. Very unique design. Looking for someone to build me a table top for me as I have a special base for it to go on. Want rustic sawn oak. It will be square in design. They are in the rustic log furniture business. I am looking for an oval shaped head and foot board made of solid oak or maple wood without the posts at the ends of the rails for a regular size bed near Ionia, Lansing or Grand Rapids MIchigan. I am looking to purchase direct a Amish built vinyl shed. My thought being I could save money buy buying direct as I am on a tight budget. Any input would be greatly appreciated. Lee, maybe if you contact one of these, they can point you in the right direction. I want to get great quality, solid wood furniture to use for a restaurant design that I am doing in the Detroit area. I do not want to buy retail, so no retailers please. I will need tables, chairs and bar stools. I would like Amish built because I want great quality! My neighboor is an Amish guy who sells furniture. You can try to reach him by phone. 517-667-0320. His name is David Coblentz and his business is Riverside Oak Furniture. He can help you. Have 30 yr old semi-custom Amish hickory kitchen cabinets. Still in great shape but need refinishing. Slab doors and drawer fronts. ok to uninstall to take to workshop and then reinstall. There was a man in the Amish community in Greenville Michigan that made Hickory Rockers and my husband bought a rocker from him for me, about 20 years ago. Our oldest Granddaughter is having our first Great grand baby and we would like to give her a rocker for a shower gift, as we also did for our older daughter. so we are trying to locate this man , and all I have on the rocker is he puts the dates on the botooms of his chairs. He had a sign along the road and that is how my husband found him. We also purchased two more rockers from him for our moms and a stool for me. I found a wooden rocking horse and am trying to find out more about the craftsman. It has an engraving inside that reads “no. 21 by N. Maynard Bartlett Saranac Mich.”. If you have info on the craftsman, that would be much appreciated.